Until the late 19th. century, one of the principal populated areas of the river Leven was at Kirkland. There are virtually no remains of the village or the mansion, which once stood amongst the trees and was the home of the Peter family, owners of the spinning mill that pre-dated the steelworks. The area, a site of approximately 15 acres, now occupied by the derelict ABC Naco steel foundry has a long history. The works on the banks of the River Leven stands on land which was once the site of the ancient village of Kirkland. In a charter of 1542, granted by the Archbishop of St. Andrews to Wemyss of Wemyss reference is made to the operation of corn mills in the village. In yet another document dated 1611, both corn and coal are mentioned. A lade dug in the 18th century brought water from Burnmill to the pit at Kirkland. The winning of coal continued in the vicinity until 1785 when a spinning mill was erected on the site for the production of sail cloth. The water from the river, previously employed to drive the colliery pumping engines now turned the water wheels which provided power for the looms. The mill also manufactured damask, using hand looms. In 1810, the Kirkland spinning mill was the first enterprise of its type in Scotland to adopt gas lighting. At the height or the industry's prosperity, the works employed 680 people, and annu­ally consumed 1,000 tons of flax and hemp. However in 1896 spinning was discontinued at Kirkland. In the same year the Scottish Cyanide Company commenced operations on the site. The product in this case was sodium cyanide, a chemical used in the extraction of gold from its ore. The majority of the output was exported to South Africa. The outbreak or the Boer War in 1899 created a depression from which the company never recovered, and it closed in 1905. In 1910, the works was rebuilt by the newly formed National Steel Foundry Limited. The layout consisted of four departments adapted for the production of heavy and light casting, and as finishing and engineering shops. Most or the business at that time was conducted on a fixed‑price basis, and the inevitable rise in costs due to the advent of the First World War forced the company into voluntary liquidation. The business was subsequently incorporated in 1914, and became known as the National Steel Foundry (1914), Limited. In 1955 the foundry became part of the Lake & Elliot group. The enterprise continued to operate until Friday, August 19, 1983 when, due to severe financial constraints, the Company ceased trading. 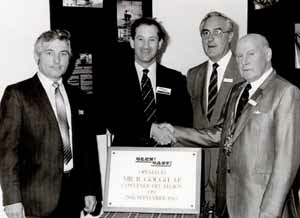 On Monday August 29 1983 Glencast Limited was formed by five ex-managers (Pete Hughes, Charlie Dorrance, A.J. Bell, Alan Barclay and Ian K. Gilmour) of National Steel who purchased the assets of the former company. The Com­pany was engaged in the manufacture of machined and unmachined castings for a wide range of industries. As might be expected, Glencast's quality control facilities and quality assurance procedures were in line with the exacting requirements of their customers. The production processes and final inspection were controlled in accordance with MoD, Lloyds Register of Shipping, British Gas, British Rail, Norske Veritas and CEGB Certification. Heavy investment in new processes such as Replicast again saw an upsurge in the Methil steel plants output but an involvement with the American company ABC NACO led to the downfall of the company in 2002. All the plant has now been sold and the buildings now stand silent. 92 years of steel production has come to an end. The area of the Kirkland village, once prosperous, now has no industry and no houses.